SHENZHEN, China, Jan. 15, 2019 /PRNewswire/ -- The latest whitepaper Shenzhen's Tech Prosperity Drives Office Demand published by JLL (NYSE: JLL) offers in-depth analysis on the latest trends in Shenzhen's fast-evolving office leasing market. At a time when the proliferation and expansion of technology companies is spurring global demand for office space, the report explores how this phenomenon is particularly pronounced in Shenzhen. As Edward Xia, Managing Director, JLL Shenzhen points out, "After four decades of economic expansion, Shenzhen is now internationally recognized as South China's technology and innovation epicenter, inevitably drawing comparisons with Silicon Valley. The strong and sustained growth that the city's tech industry is currently experiencing is set to form an important source of office demand in coming years". On the 40th anniversary of Reform and Opening, no transformation better exemplifies the growth and modernization of a Chinese city than Shenzhen. From its humble beginning as a rural fishing village, to current status as a tech-centric megacity, four key inter-related factors have driven this remarkable transformation. A combination of economic reform, capital-backed start-ups, agglomeration, and the ability to attract top talent are behind the Shenzhen tech industry's growth to date, and they will continue to propel it rapidly into the future. Between 2011-2015, over 41,000 Patent Cooperation Treaty filings came from the Shenzhen-Hong Kong cluster, the second highest in the world, and firmly ahead of many traditional innovation hubs. Silvia Zeng, Head of Research, JLL South China, said: "Shenzhen offers a unique model in which government initiatives, entrepreneurial spirit, corporate headquarters, talented people, business clusters, and plenty of investment capital, have come together to fuel the technology sector's growth, and a corresponding surge in Chinese innovation." In terms of office leasing demand, the tech industry is the most active player in the Shenzhen office market. It has spurred the city's evolution, with the last 15 years witnessing an eight-fold increase in office stock to 6.4 million square meters by late 2018, making Shenzhen the third largest office market in Mainland China. Demand for office expansion is being supported by both the growth of existing sectors and emergence of new ones. As staff numbers increase, the expansion and relocation of main or regional headquarters of the multinational tech giants and larger firms will lead future demand. The JLL report also points out that many tech firms can now afford higher rents and are also seeking to raise their corporate image, making upgrade demand another important force in the Grade A office market. Shenzhen expects a staggering 7.6 million square meters of Grade A office supply to come online in the next five years. Active future demand from tech firms will be focused on Shenzhen High-tech Industrial Park and the surrounding Nanshan business district, which will remain Shenzhen's core submarket for the tech industry, accounting for 60% of future supply. With the predicted acceleration in the tech industry's growth, demand for business park space will rise, driven by expansion and setup. 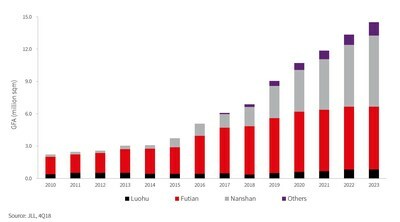 Emerging sectors with large space requirement such as robotics, will find suburban locations such as Bao'an and Longgang ideal for relocation or expansion. A new generation of workforce is calling for upgraded working environments that elevate user experience and promote innovative thinking through the latest technologies. This is particularly true of the innovative and progressive younger workers that the tech industry tends to attract. As Zeng points out, "A significant proportion of Shenzhen's future office supply will consist of corporate headquarters. As more companies begin to recognise the various benefits that Future of Work models can generate, an increasing number of offices in Shenzhen are expected to adopt this concept." Co-working will also become an important channel to meet future office demand. As expanding tech companies begin moving to semi and fully-furnished flexible offices with short-term leasing options, a number of experienced global co-working service providers are weighing up their prospects for entering Shenzhen's highly dynamic market. The Greater Bay Area looks to have a bright future, with Shenzhen as a major driver with a booming office market closely linked to the flourishing tech sector. Both start-ups and established tech enterprises will ensure this surging office demand, while foreign institutional investors continue to pay close attention to assets in the region. As Jex Ng, Managing Director, JLL South China emphasizes, "Due to acute land supply shortages in Shenzhen, a significant amount of manufacturing, including even some from the hi-tech sector, will have to be relocated outside of Shenzhen. As the city's tech industry grows in coming years, such relocations will play an important part in the Greater Bay Area's industry upgrade process, helping many nearby cities replace traditional manufacturing with hi-tech alternatives."